I may as well wrap up this series on obscure insect orders I seem to have been doing with one of the most obscure of all - the Zoraptera (for earlier installments on obscure hexapods, see here, here, here and here). Zoraptera are inhabitants of rotting logs in tropical forests (shown above in a photo from The Papua Insects Foundation). A few species range north of the tropics in North America and Asia. Until recently, they were regarded as quite rare, but apparently they have turned out to be not uncommon in suitable habitat. 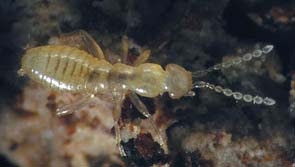 Zoraptera are semi-social, living in colonies of up to a hundred or so individuals. The name "Zoraptera" means "purely wingless" (the reason for the name should be obvious), and an alternative translation of "zoros" (the same element as in the beginning of "Zoroaster", I believe) explains the occassionally used common name for Zoraptera of "angel insects". There is absolutely no rational justification for calling Zoraptera angels, but the name is just poetic enough that I hope it catches on. It is now known that winged Zoraptera do exist, just not very often. Because rotting logs at just the right stage of decomposition are a temporary resource, zorapterans have an aphid-like life cycle, with blind, wingless individuals breeding and multiplying in their log until resources start running out, at which time winged individuals with eyes start to emerge. These winged individuals are able to leave the doomed colony and seek out a new piece of suitable habitat elsewhere. Notably, the majority of winged dispersers are female - males are quite rare. Female dispersers probably mate with males of their parent colony before dispersing. Most authors include living species in a single genus, Zorotypus. Kukalová-Peck & Peck (1993) did establish a number of new genera, but as their classification was based on wing characters and could only be applied to a selection of recent taxa (leaving those species for which winged individuals were unknown in a Zorotypus of convenience) it has not been widely accepted. A species from Cretaceous amber has been placed in a distinct genus, Xenozorotypus, with species of the modern genus Zorotypus also known from the same time period (Engel & Grimaldi, 2002). As I alluded to previously, the phylogenetic relationships of Zoraptera are rather obscure, to say the least. To quote Engel & Grimaldi (2002): "At one time or another Zoraptera has been considered sister to Isoptera (Boudreaux, 1979; Caudell, 1918; Crampton, 1920; Weidner, 1969, 1970), Isoptera + Blattaria (Silvestri, 1913), Paraneoptera (Hennig, 1953, 1969, 1981; Kristensen, 1975), Embiidina (Minet and Bourgoin, 1986; Engel and Grimaldi, 2000; Grimaldi, 2001), Holometabola (Rasnitsyn, 1998), Dermaptera (Carpenter and Wheeler, 1999), Dermaptera + Dictyoptera (Kukalová-Peck and Peck, 1993); basal within Thysanoptera (Karny, 1922) or Psocoptera (Karny, 1932); or unresolved within either basal Neoptera (Kristensen, 1991) or Orthoptera, Phasmida, and Embiidina (Kukalová-Peck, 1991)." At present it is pretty well-accepted that Zoraptera are somewhere within the Polyneoptera, the clade or grade including the cockroaches, crickets, etc., but getting more resolution than this is still difficult. Engel & Grimaldi (2002) favour a relationship to Embioptera, while Terry & Whiting (2005) link them to Dermaptera (earwigs). Rasnitsyn (2002) points out that the characters Engel & Grimaldi used to link Zoraptera to Embioptera are prone to homoplasy, but his own suggestion of a sister-relationship to Holometabola is poorly supported. Engel, M. S., & D. A. Grimaldi. 2002. The first Mesozoic Zoraptera (Insecta). American Museum Novitates 3362: 1-20. Kukalová-Peck, J., & S. B. Peck. 1993. Zoraptera wing structures: Evidence for new genera and relationship with the blattoid orders (Insecta: Blattoneoptera). Systematic Entomology 18: 333–350. Rasnitsyn, A. P. 2002. Cohors Cimiciformes Laicharting, 1781. In History of Insects (A. P. Rasnitsyn & D. L. J. Quicke, eds.) pp. 104-115. Kluwer Academic Publishers: Dordrecht. Terry, M. D., & M. F. Whiting. 2005. Mantophasmatodea and phylogeny of the lower neopterous insects. Cladistics 21: 240-257. If the females only mate with males from their parent colony how do they prevent inbreeding? Winged males are rare, but not non-existent. I expect that there are no reasons why winged females can't mate with any suitable males they encounter as they disperse, as well as males from the original colony. They superficially look like termites in that picture. Termites are undoubtedly derived Dictyoptera. I suspect similartites between zorapterans and termites are convergenes due to similar habitats and loss of eyes.